Selected Works of Corey Lee Wrenn, Ph.D. This article discusses a dairy advertising campaign featuring skeptic Derren Brown. I explore the various health claims made in the ads as well as a report Brown featured on his website that claimed consumption of cow’s milk is linked to longevity. I discuss how dairy consumption is largely linked to race and ethnicity. It is a practice enjoyed primarily by European whites as most nonwhites are lactose intolerant. Lactose intolerance is a normal biological process associated with weaning, but it is medicalized and made deviant because it is not part of the white experience. I also mention comments made by Sam Harris and Richard Dawkins that normalize Western diets with unsubstantiated claims. This article takes a critical look at skeptic leaders who have failed to address misleading information perpetuated by exploitative animal product industries. Wrenn, C. L. (2017). 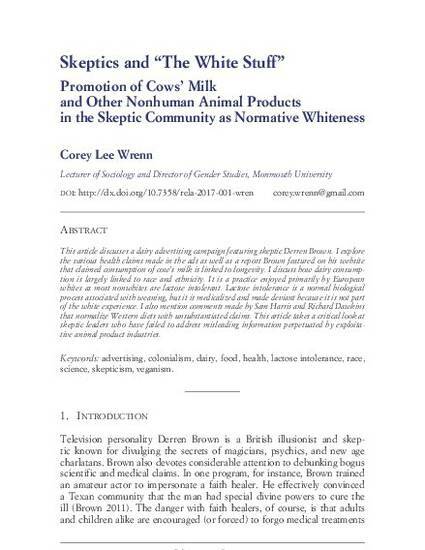 Skeptics and ‘The White Stuff’: Promotion of Cows’ Milk and Other Nonhuman Animal Products in the Skeptic Community as Normative Whiteness. Relations. Beyond Anthropocentrism, 5(1), 72-81. Contact Corey Lee Wrenn, Ph.D.